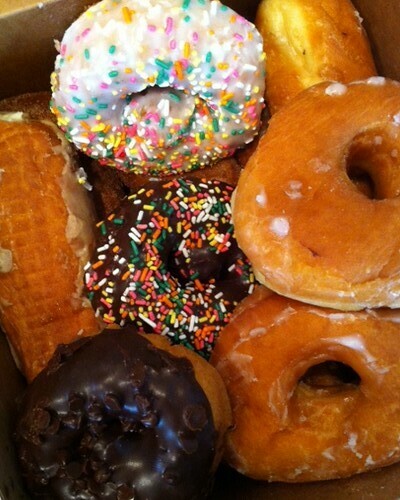 I know I’m not the only one who can’t live without doughnuts. I don’t eat them often, but they are an extremely welcomed indulgence whenever I feel like really treating myself. For all of you doughnut lovers out there, have you ever heard of Spudnuts, or any other doughnuts made with potato flour for that matter? Spudnuts is a doughnut shop in Panama City Beach (along with many other cities across the country) that I discovered thanks to Greg and his family on one of my first trips to the city a few years ago. Oh my word, they are heavenly. This past weekend, we were in PCB and I couldn’t wait to get my Spudnuts fix. The cream-filled (NOT CUSTARD!!) long johns are my absolute favorite. I also split a cinnamon sugar twist with Greg. 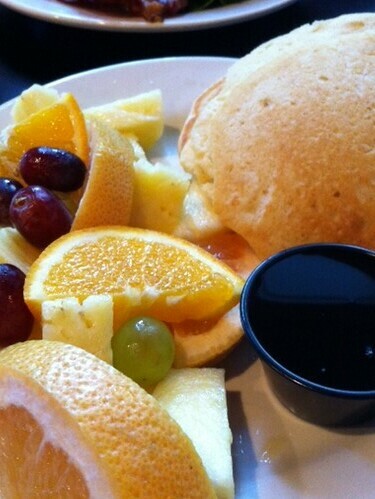 Pancakes are another welcomed treat for me. I have pancakes much more often than doughnuts, but I still have to have an excuse to opt for pancakes rather than a more nutritious meal. Last week, I met with my good friend Hannah at The Village Bakery for breakfast and some good spiritual talk. As my first time at the restaurant for a sit-down meal, I knew I had to do it right. 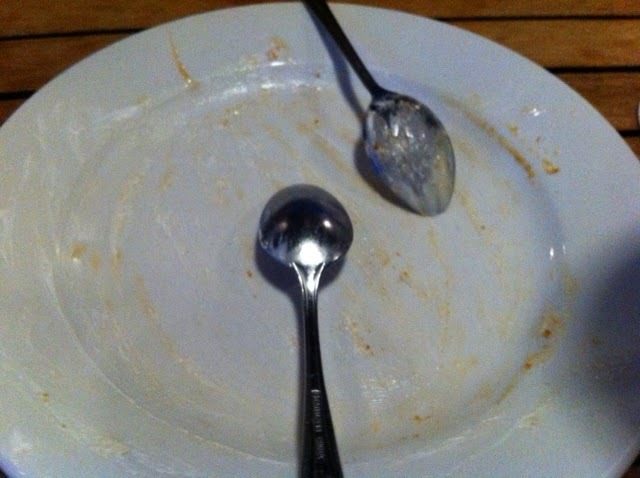 Pancakes it was! It was so worth it. The fruit on the side cancelled out any negatives, right? These pancakes, and my time with Hannah of course 😉 , were the highlight of my day. Doughnuts and pancakes are great, but you know what never gets old? Good old fashioned PB&J. 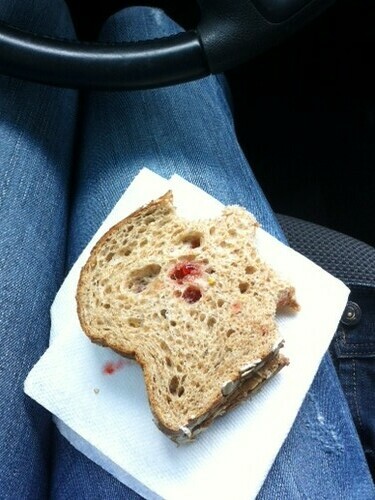 Eating a PB&J sandwich while driving is optional. 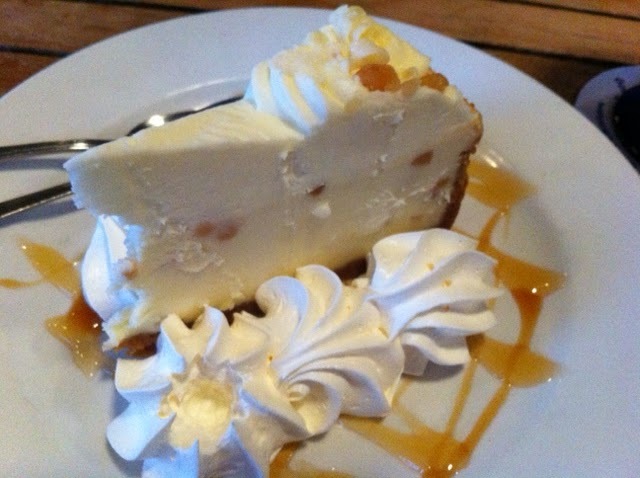 Driving or not, it only takes one bite to realize it’s a classic for a reason. If you use whole wheat bread, all-natural peanut butter and all-natural jelly or preserves, there’s no reason to feel guilty either. Paired with an apple or some baby carrots and you’ve got a perfectly simple and satisfying lunch. You + PB&J…make it happen. You know you want to. Hello from Panama City Beach, Florida! Greg and I woke up in the middle of the night Friday, 3:55am to be exact (no, I don’t consider that early morning, it’s the middle of the night), and made the eight hour trek down to the panhandle to spend Easter weekend with our parents. After refueling from the long drive with a plate of fresh fruits and veggies, we packed the car for the beach. The weather was beautiful and we took a family stroll along the white sandy beach for most of the afternoon. Dinnertime came quickly and we knew just the spot: Boatyard. We had gone to this restaurant both times I have been here before. It’s literally right across the street from the house, making a good excuse to get even more walking into our day! We sat outside and the atmosphere overall was great. It was energetic, fun and relaxing. Besides the health benefits of my new lifestyle of eating a plant-based diet (maybe not 100% of the time, but MOST of the time), it sure makes ordering dinner much easier! While I normally would spend a good 10-15 minutes deciding what delicious meal I wanted from the menu, my options at this restaurant were extremely limited, as most everything involved seafood, chicken or steak. 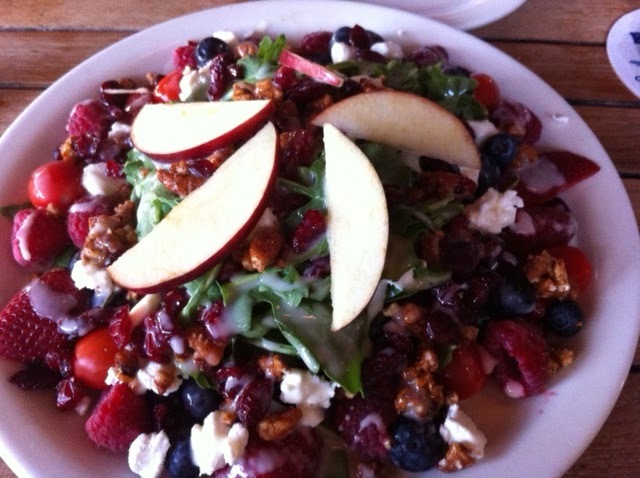 My eyes went straight to the salad section and I immediately chose the Spinach and Arugula Salad – “Baby Spinach and Arugula topped with Pear Tomatoes, Strawberries, Raspberries, Blueberries, Dried Cranberries, sliced Apples and Goat Cheese, drizzled with an Apple Cider Vinaigrette.” There were even walnuts mixed in, which was a nice surprise since they weren’t listed on the menu. This salad could not have been more perfect! I ate every single last bite. Besides the goat cheese, every part fit my diet and I had nothing to feel guilty about. Then came dessert. Now, I have said I will make exceptions and this is one of those times. 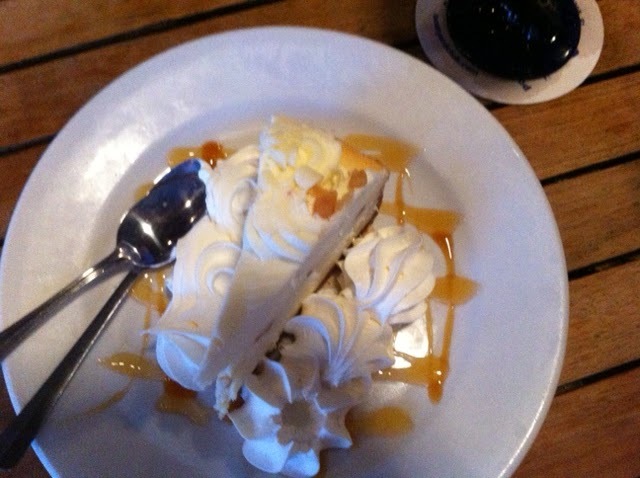 Greg’s mom pointed out the White Chocolate Macadamia Nut Cheesecake and I was sold. Greg’s eyes lit up too, and it’s rare he gets excited for dessert! We split this slice and I was perfectly satisfied. As you can see, we didn’t leave much behind. I scooped up as much caramel and whipped cream as I could. The macadamia nut flavor was stronger than I imagined, but in a good GREAT way. I don’t know if the healthfulness of my salad makes up for this downfall, but I don’t regret it at all. Baby steps, my friends. Baby steps. I’m off with the family for another beach day! Hope you all are spending this Easter weekend with loved ones. Have a great day!